There was a recent discussion on examples of dry rhythm, but can anyone explain why this movement has/is happening ??? What I love about Django and earlier gypsy jazz, any Rosenbergs stuff, is the vibrant, lively, la-pompe rhythm playing, great for blasting it for staying awake through traffic for example, or just to get one's spirit up. The current dry rhythm trend, what I call the un-pomp, to me personally does nothing of the previously mentioned emotions. On the contrary, I can't listen to for example Gonzalos "The New Hot Club of America" album because to me the rhythm playing is so dry, monotone, and frankly depressing. So why ruining a winning formula ? Is it in the name of "progress" ?! Seems like regression to me. If it swings, supports the melody or soloist, and isn't too loud, it appears to be personal preference. Of course it's a matter of preference, but swinging?! it sounds more like marching; well I did hear the un-pomp described as "german" . Because the genre has incorporated later musical influences. 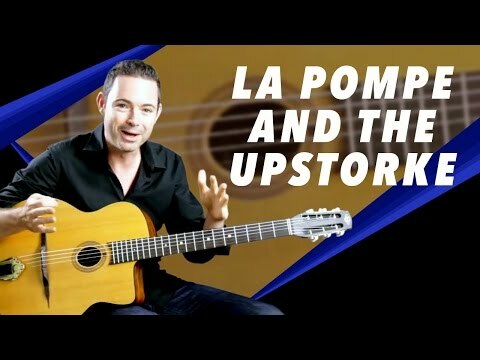 Classic la pompe variations convey the rhythmic character of swing-era music. The dry even 4 rhythm is basically a bebop feel, and the variants with a heavy 1-3 and dry 2-4 are reminiscent of hard bop. Alternative history: because everyone got confused by the overly compressed sound of Hono Winterstein on Bireli's Gypsy Project. I sometimes wonder where did this style come from. Now that you mention it I think it vaguely rings familiar. Wow, I'm at a loss for words. Gonzalo doesn't swing? Hmmm....not sure what to even tell you. Maybe it's just more 'subtle' if you want to even think of it that way but definitely still swings. All I can say is just listen more and not analyze too much??? I've taken rhythm lessons from both Gonzalo and Jeff R. and I can tell you they both swing like crazy. Not only "to me" as I didn't come up with the "german" description, it's described by many as in the video below. And when did I write "Gonzalo doesn't swing" ?! I simply wrote his "swing" rhythm is unappealing to me, do I have to be part of group think here? Are you sure you're not mixing things up here? If you're putting "german" style into the un-pomp category, then you're putting Hono into it too. I'm guessing you probably didn't mean to put Hono into that group of rhythm players who's swing is unappealing to you. Edit: Ok I see Kevin said in the video that a lot of the French style are adopting the "german" style so that's probably why you said that. I'd call that a misnomer in terms of describing them as similar. Maybe what @Pompier said in terms of how it may have come to be the style used by a lot of French guys, including Gonzalo and A. Holovaty. Which by the way, two of them in the video sounding sounded nothing like Adrian (Robin's demonstration) and Gonzalo (Kevin's). Listen...that particular style doesn't appeal to you. That's fine because that's your preference. I'm not representing any group (other than all the voices in my head) and I'm not trying to convince you that your preference is wrong. I've heard some stuff that swings hard that doesn't have the upstroke as I've heard stuff with the upstroke that sounds like a gallop that doesn't swing at all.